where you will get the opportunity to listen to the issues about the Ribble barrage & the building developments proposed for the Green Belt/floodplain in Penwortham, and ask questions. 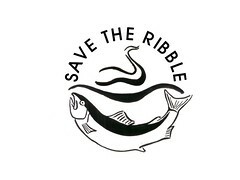 Preston Riversway Councillors are arranging the meeting in conjunction with Save The Ribble. - but this is YOUR OPPORTUNITY TO COME AND LISTEN TO THE ISSUES AND ASK QUESTIONS. This meeting is still going ahead despite recent news that the barrage and building developments are currently taking a back seat whilst more immediate consideration is being given to the feasibility of proposals to improve the Docks and look at reinstating the Lancaster Canl into Preston so book the evening of 20th November in your diary! Riversway Councillor Jack Davenport made his point about the blindness of the leadership of Preston City Council to issues of flood risk around drainage and flood defences near the Ribble very vividly at the last City Council meeting, he produced two sandbags which he proceeded to place at in front of Council leader Ken Hudson and his ally Danny Gallagher, leader of the Liberal Democrats in Preston. According to the Lancashire Evening Post Jack Davenport's "attention grabbing stunt" was a protest over the "plans to build homes on flood plains near the River Ribble... sand was spilled all over council papers and prompted a furore in the chamber over how the bags got past Town Hall security"
The protest came a month after the Council flatly refused to debate a motion about the risk of flooding to Preston residents - the council leaders preferring to put the interests of the developers interested in the Riverworks Project ahead of the interests of Preston People. "The Conservative group is happy to talk to anyone else prepared to look at funding a study for the Riverworks project"
- they are happy to talk to anyone willing to progress the Riverworks barrage but NOT talk to anyone concerned about the environmental impacts or flooding risks! Bizarrely, Ken Hudson then went on to accuse those councillors concerned about these issues and who DO wish to discuss them of sticking their "heads in the silt of the river... waiting to be drowned" when it is clearly the pro-barrage lobby who are refusing to listen to the evidence and discuss the issues! Jack Davenport is calling for urgent action in the wake of severe flooding across the country, that shows how vulnerable many areas are to flash flooding, particularly where drainage and flood defences are inadequate. (As they certainly are near Broadgate and Middleforth). I'm writing to salute your recent protest on behalf of Broadgate residents about the Riverworks plans. I feel you are doing an excellent job bringing the flood risk posed by the Riverworks Barrage and Housing ideas to public attention, you are doing exactly what a democratic representative of the public should be doing. You may be criticised for it by a few political hacks, but I definitely think the idea of using sandbags in this way showed imagination, panache and not a little courage, that will be appreciated by ordinary Prestonians. Thankyou for representing me so well as one of your constituents, and keep up the good work! Thatcher used to give her ministers a handbagging - Now Jack Davenport gives Preston Council Leaders a sandbagging! "the issue I was trying to raise was the issue of flooding from drainage. The issue of Riverworks, though related, was not the exact topic of discussion (that is to come), but the general issue however is that the current administration appears blind to the whole thing and won't discuss it. I've heard of putting ones head in the sand, but never putting it in a sandbag!" 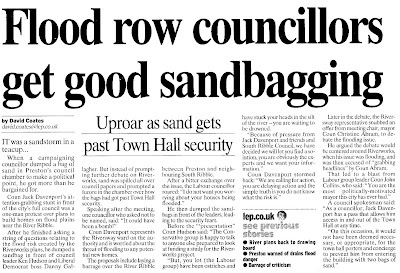 Let us know your own response to Councillor Davenport's sandbag protest by replying to this article below! 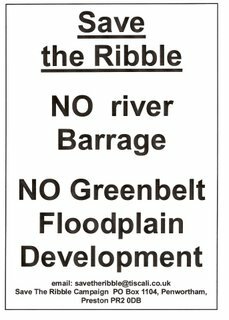 Ribble Barrage and Floodplain Building Developments Take 'Backward Step' - Has The Ribble Been Saved? BREAKING NEWS... RIBBLE BARRAGE GOES BACK TO DRAWING BOARD!! The Lancashire Evening Post are reporting today that Preston City Council Chief Executive Jim Carr has stated that the Ribble barrage and the 'plans to redevelop an area of the river in the city and neighbouring South Ribble' have 'gone back to the drawing board'. "The riverside element has taken a step back from where we were (before the local elections earlier this year) because of the political changes here and in South Ribble". "What we are now relying on is discussing this between the leaders to see what is acceptable to them. Much of the development is in South Ribble and now it is an issue of whether it wants to progress this". Luckily for the River Ribble, our environment, and our communities, it seems that not only the Labour Councillors in Preston are opposing the barrage and building development schemes - such as Jack Davenport, Bhikhu Patel, and John Swindells (see below for an excellent letter by Cllr Swindells) - but South Ribble Council are also listening to the evidence we have researched and made publicly available, and to the serious concerns raised by South Ribble residents, and seem to have forced a halt to the project. The new political make-up in South Ribble occurred largely as a result of South Ribblers' concerns about Preston's plans for the Penwortham side of the river - and the successful South Ribble Conservatives campaigned about local concerns regarding Preston's plans for South Ribble - particularly the Riverworks plans for building a huge new urban conurbation on the Penwortham Green Belt and floodplain. We are extremely pleased that our tireless research, and our innovative blogging and campaigning techniques to let the public know about the real impacts of what a barrage and building developments would mean for our River, environment, Green Belt, floodplains, riverbanks, allotments, sports pitches, and communities, have encouraged Councillors and Council Officials to start to listen, and begin to think about making informed decisions and take the only logical step of opposing the barrage and building development schemes. Our hope now is that common sense prevails and the barrage and riverside building developments will be consigned from the drawing board to it's rightful place in the dustbin. Mr Carr's statement will not be anywhere near clear enough for most Preston residents, especially those living in areas that would face an increased flood risk if the barrage and floodplain housing were built, and those who care deeply about the Ribble environment - the council must state absolutely whether the barrage and the associated housing plans are off the council agenda for good, or whether they will later be drawn back out of their coffin like a vampire in the absence of the clear sunlight of public attention, which has been focussed by the Save The Ribble campaign onto this dangerously stupid, irresponsible and highly unpopular project. We also have major concerns that the Vision Board has still not abandoned it's plans to turn the Southern bank of the Ribble into a suburban extension of 'Greater Preston', there is no doubt that greedy developers have their eyes on this land, and that they still have strong influence over the future of our area. According to the LEP, Mr Carr also said that what the Governments decides regarding 'targets for new homes' in the area 'would also guide the future of the riverside plans, which centre around new housing overlooking a marina created by the barrage'. But surely targets for new homes don't specify that these need to be built on the banks of the river or on the Green Belt and floodplains?!! Any new housebuilding in either Preston or South Ribble needs to avoid building in areas at high risk of flooding - as the Environment Agency advise. Otherwise the new houses and our existing homes will be at even greater risk of flooding, and our beautiful riverside areas, our football pitches and allotments, would be lost beneath tonnes of concrete, ruining their precious contribution to our environment as well as increasing the flood risk to our homes!! South Ribble and Preston Councils must give a clear guarantee to the people that the greenbelt and floodplain land by the Ribble is sacrosanct, and will be kept as a beautiful green and natural area for the public to enjoy forever. 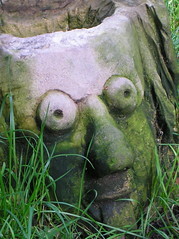 "Until May I was Preston City Council's cabinet member for environment and sustainability. During my term I discussed the Ribble barrage with many groups and organisations including the RSPB, Environment Agency, the Anglers Conservation Association etc. All these organisations were united in their total opposition to the barrage. 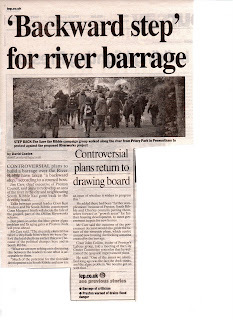 In fact I never spoke to any organisation who voiced their support for the barrage." "There followed the LEP survey where an overwhelming number of Prestonians were against the scheme. 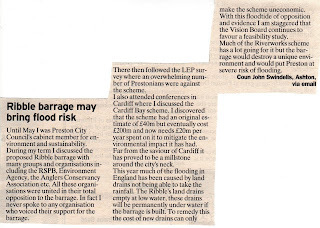 I also attended conferences in Cardiff where I discussed the Cardiff Bay scheme. I discovered that the scheme had an original estimate of £40m but eventually cost £200m and now needs £20m per year spent on it to mitigate the environmental impact it has had. Far from the saviour of Cardiff it has proved to be a millstone around the city's neck". "This year much of the flooding in England has been caused by land drains not being able to take the rainfall. The Ribble's land drains empty at low water, these drains will be permanently under water if the barrage is built. To remedy this the cost of new drains can only make the scheme uneconomic. "With this floodtide of opposition and evidence I am staggered that the Vision Board continues to favour a feasibility study. "Much of the Riverworks scheme has a lot going for it but the barrage would destroy a unique environment and would put Preston at severe risk of flooding". Whilst Preston Council have been forced to slow down on the barrage by having to listen to South Ribble's opinions on the issues, to whom are Preston Vision Board accountable...? This Thursday, 18th October, PCC’s Chief Executive Jim Carr will present a Position Statement about the Riverworks Project to both the City Centre Committee in the morning, and to the full Council meeting in the afternoon. - We welcome any attempts to improve the dock basin as a public facility, and particularly to solve the blue green algae problem, and ensure that the dock gates are kept in a better state of repair to ensure the algae remains safely out of the river in the meantime! - The easy answer to this is YOU CAN’T!! The Water Framework Directive is the most substantial piece of European-wide water legislation to date. It aims to ensure all inland and coastal waters achieve ‘good’ status by 2015 in relation to its ecological status and the sustainability of our water resources for people. The River Ribble is the Environment Agency’s Pilot River Basin for the implementation of the Water Framework Directive in the UK. • As the Anglers' Conservation Association have pointed out: ‘the experience from other barrages elsewhere in the country and the rest of the world should have demonstrated by now to anyone doing even a cursory review of the literature, that they are nearly always more costly to construct and maintain than originally envisaged and that they have severe impacts on the ecology of rivers on which so much of the local economy depends. See our earlier blog about the Ribble Fisheries Consultative Association's opposition to the Barrage proposal. 2. a barrage would still be subject to river conditions and the weirs would need to be left fully open for long periods to ensure local communities do not flood. There is also the problem that concreting the river banks will destroy their ecological importance and be contrary to the UK and Lancashire Biodiversity Action Plans and destroy one of the most aesthetic aspects of the River Ribble, its largely unspoilt riverbanks – as well as increase the speed of the river and rendering it more dangerous! Surely it makes much more sense to build a purpose-built lake for row-boating as this will not have to close for long periods of time due to high rainfall, will not interfere with the natural ecology of the river, and will not increase flood risk in the area – and will actually help increase our flood protection! The bodies responsible for maintaining the ecological integrity of the River Ribble AND maintaining our flood protection produce the Ribble Shoreline Management Plan and the Ribble Integrated Catchment Management Plan, both of which point out that increasing our wetland provision of mudflats and saltmarsh and floodplain storage capacity is the most effective means of flood protection along the Ribble corridor. ‘It [the barrage] would also allow a mirror park on the opposite bank to Avenham & Miller Park to be laid out, creating a magnificent central park for the area with bridges linking the two elements’. - At risk of pointing out the obvious, we don’t need to barrage the river to create a park on the Green Belt!!! Whether the green belt on the Penwortham bank would benefit from having some of it turned into a formal park is a separate issue. There could certainly be a number of improvements to the area, such as more footpaths and benches and other public areas, and some special wildlife walks, sculpture trails and so on would undoubtedly be a great addition to the existing green facilities. But its real and intrinsic value to local communities and the environment is that it is already a quality green open space with a diverse range of habitats, wildlife, and facilities - including allotments and sports pitches, freely accessible to all members of the community. It also acts as the operational flood plain for a number of communities in South Ribble and Preston, so enhances our quality of life in a number of crucial ways. ‘When the intention to commission this study was announced a number of concerns were brought to our attention. Assurances were given that any feasibility work would fully take into account the concerns raised. In particular, statutory agencies concerned about existing flood risks and how they might be alleviated were interested in how the study could contribute to the body of knowledge that exists and potentially provide solutions’. -But surely we really do have more than enough information about the impact of barrages, the crucial importance of the River Ribble as a natural, free-flowing ecosystem to the environment and to our flood protection strategies to spend the many £hundreds of thousands on projects which will be of benefit to those areas of Preston which really do need economic investment? Preston has some of the worst areas in the country in terms of deprivation and child poverty. Why aren't Preston City Council looking to spend these huge sums of money there? ‘The technical feasibility study for the Quayside [dock basin] is about to be commissioned. As the North West Development Agency (NWDA) have already pointed out, the North West’s Natural assets – green tourism opportunities – already boost the regional economy by £770m EVERY YEAR. And they claim the Ribble - recently designated a Regional Park, Ribble Coast & Wetlands - will act as the Regional catalyst for new economic opportunities based on the growing eco-tourism industry. ‘The strategic flood risk assessment referred to in Councillor Davenport’s notice of motion [rejected by the Council when Councillor Davenport asked them to halt progress on Riverworks to allow the flood risk assessment to be implemented first] is not yet available so I am not able to comment on its implications in this report. In due course, no doubt the outcome will inform the discussions on the LDF and, therefore, ultimately the reasonableness or not of proceeding to a study’. There is no mention in the Riverworks Position statement regarding any moves on the Canalside elements, so we presume these are still in the very early stages. 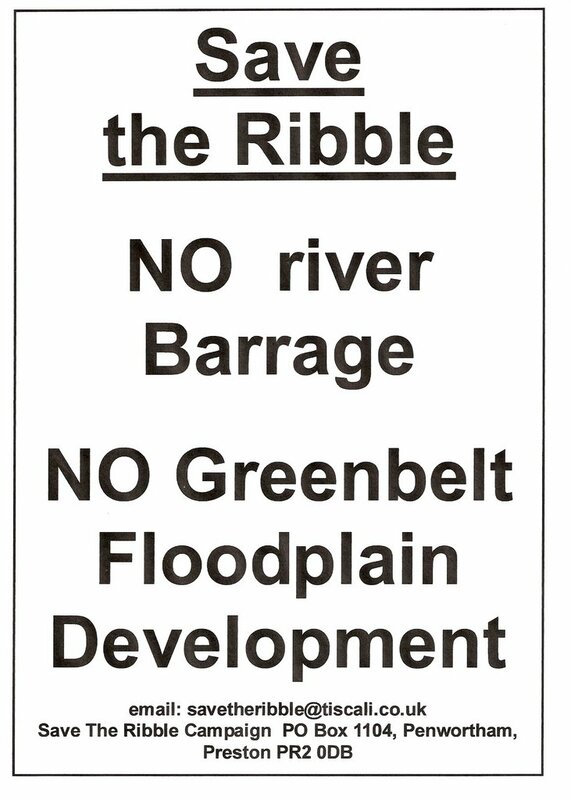 We would urge Preston City Council to drop the Ribble barrage and their attempts to build on the Ribble's banks and green spaces and concentrate on improving the docks and reinstating the canal - both schemes will be of benefit to our abilities to access these spaces WITHOUT ruining THE MOST IMPORTANT ASSET OF THE RIBBLE CORRIDOR - THE RIVER RIBBLE!!!! Why Our Wetlands are Important to our Economy, Our Environment, and to protect us from flooding. 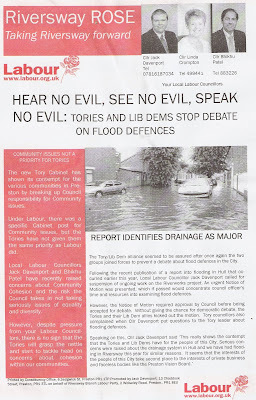 Riversway's Labour Councillors, Jack Davenport, Linda Crompton and Bhikhu Patel have been distributing a hard-hitting leaflet around the ward recently, denouncing the failure of the City Council to debate the flood risk posed by Broadgate's old and dilapidated flood defences and by the inadequate and poorly maintained storm drainage in the area. Jack Bavenport is quoted as saying " This really shows the contempt that the Tories and Lib Dems have for the people of this City. Serious concerns were raised about the drainage system in Hull, and we have had flooding in Riversway this year for similar reasons. It seems that the interests of the people of this City take second place to the interests of private business and faceless bodies like the Preston Vision Board"
The leaflet uses a picture of recent flooding in Middleforth, taken from original material published on the 'Save The Ribble' Blog - Hey Labour Party - we don't mind people using quotes and photographs from this blog, providing they are being used to further the interests of our river and the people who live nearby - but next time please be polite enough to credit the source of your photo - The Save The Ribble Campaign! You can read 'Save The Ribble's' investigation of the state of Preston's flood defences here.